Whisk maple syrup, mustard, oil, vinegar, and pepper in small bowl until well blended. 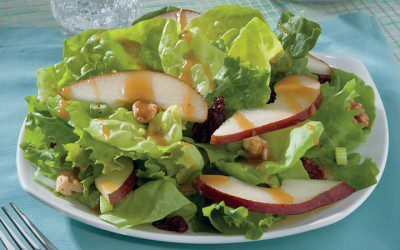 Combine greens, pear, green onions, cherries, and walnuts in large serving bowl. Drizzle with dressing; gently toss to coat. *Note: To toast walnuts, spread in single layer on baking sheet. Bake in preheated 350°F oven 5 to 7 minutes or until fragrant, stirring occasionally. Exchanges per serving: 1 Fat, 1 1/2 Fruit, 1 Vegetable.